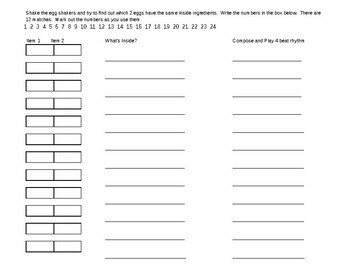 Students will shake eggs filled with goodies of your choice to find a match, identify what is inside, and compose and shake a 4 beat pattern. Make it easy for K by just matching the numbers together in small groups. Write the inside choices on the board for 1st and 2nd. Let your older students work in small groups to complete! Teachers will use 24 eggs per group. Label with numbers and fill 2 with an item of their choice. I used dice, jingle bells, macaroni, erasers, paper clips, beads, pacifier, googley eyes, gold coins, confetti, fruit loops, and 1 jelly bean. I taped them shut with packing clear tape. Have fun!